Top-ranked Ascenders get tests with IMG National Classic, National High School Invitational. The next two weeks likely will determine if IMG Academy can finish the year as the No. 1 team in the nation as the Ascenders host their own tournament this week and play in the National High School Invitational in April. A national champion isn't normally decided in early April, but IMG Academy's unique circumstances make that the case. The Ascenders do not participate in the Florida High School state playoffs and conclude their season on May 3. They play a pair of powerhouse Florida teams in April, however, as they take on No. 9 Doral Academy (Doral) on April 12 and No. 12 Jesuit (Tampa) on April 27. The Ascenders, now 10-0 after two wins last week, hold their own tournament this week, opening with Xaverian (Brooklyn) on Tuesday. Team USA has also announced that La Mirada (Calif.) will play IMG Academy in the first round of the NHSI on April 3. Three teams from Texas continue to tail IMG Academy with Lake Travis (Austin) undefeated at 16-0; Colleyville Heritage (Colleyville), led by the nation's No. 1 prospect Bobby Witt, at No. 3 with a 16-1 record; and No. 4 Argyle, the defending national champion, at 18-1-1. New Teams: American Heritage (Plantation, Fla.) at No. 18, Spruce Creek (Port Orange, Fla.) at No. 19, Christian Brothers (St. Louis) at No. 23, St. Laurence (Burbank, Ill.) at No. 24. Dropped out: No. 16 Saint Francis (Mountain View, Calif.), lost one; No. 22 The Woodlands (Texas), lost two; No. 23 Mosley (Lynn Haven, Fla.), lost one; No. 25 Corona del Sol (Tempe, Ariz.), lost one. Player of the Week: Jonathan French, Parkview (Lilburn, Ga.). In the Panthers' four wins last week, French was 6-for-11 with two doubles, two home runs and 10 RBI. 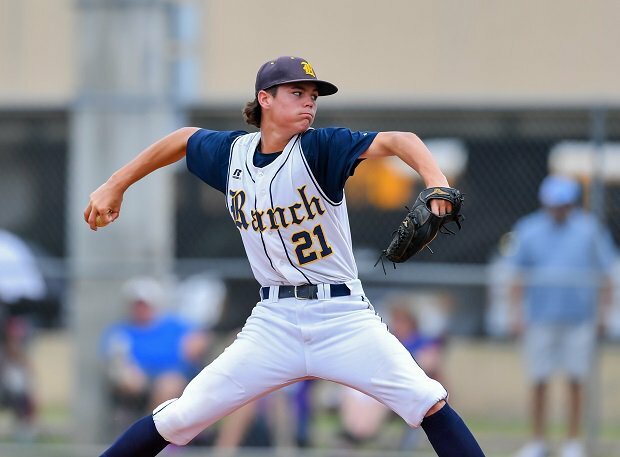 Prospect of the Week: Nolan Hudi, Calvary Christian (Clearwater, Fla.), one week after losing the first game in his career, Hudi threw his first career no-hitter in a seven-inning, 3-0 win over Berkeley Prep (Tampa). Hudi struck out 12 and walked two in the win. For the season he is 3-1 with a 0.00 ERA and 32 strikeouts with three walks. He is also batting .538. Game of the Week: IMG Academy 4, Winter Haven 2 (11). In its toughest test of the season, IMG Academy needed extra innings to defeat Winter Haven. The two teams played 11 innings before IMG scored twice in the top of the 11th on a two-run homer by Will Bartlett. In the bottom of the winning, Winter Haven loaded the bases with one out, but Billy Underwood struck out the final two batters to end the game. Game to Watch: New Hanover (Wilmington, N.C.) vs. Topsail (Hemstead, N.C.). New Hanover went 28-1 last year with no official losses during the regular season en route to winning the state championship. However Topsail actually defeated New Hanover twice (2-1 and 1-0), but had to forfeit both games. New Hanover is currently ranked No. 5. Tournaments of the Week: Spring Break Tournament (Jacksonville) — teams include Providence School (Jacksonville), American Heritage (Plantation, Fla.), George Jenkins, Trinity Christian Academy (Jacksonville). Boras Classic Southern California — First round games include Etiwanda vs. JSerra Catholic, Maranatha vs. Rancho Bernardo, Notre Dame Sherman Oaks vs. Orange Lutheran, Huntington Beach vs. LaMirada, Cypress vs. Mira Costa, Yucaipa vs. Simi Valley, Corona vs. Mater Dei, Ayala vs. Great Oak. IMG National Classic — teams include IMG Academy, Venice (Fla.), Flanagan (Fla.). Results: After racking up their sixth straight shutout in a 6-0 win over St. Petersburg, IMG Academy had its toughest test of the season with a 4-2, 11-inning win over Winter Haven. Stats: Rece Hinds was 1-for-3 with a double and two RBI against St. Petersburg. Brennan Malone got his fourth win of the season and kept his ERA at 0.00 with eight strikeouts. Tucker Mitchell and Will Bartlett each had home runs against Winter Haven. This week: Xaverian (Brooklyn, N.Y.) in first round of IMG National Classic on Wednesday. Stats: Brett Baty and Jimmy Lewis both homered with Lewis also adding a double against Del Valle. Parker Guerin also had two doubles and Kyle Kilgo had a double and two RBI. Kaeden Kent was 2-for-2 with three RBI. This week: Hays (Buda) on Tuesday, Anderson (Austin) on Friday and Bowie (Austin) on Saturday. Results: The Panthers had two big blowout wins over Saginaw, 15-0 and 10-0. Colleyville then beat defending Class 6A champion Carroll (Southlake) 4-1. Stats: Austin Thorp and Bobby Witt each had doubles in the first game while Witt had a double in the second game. Witt went 3-for-4 with a double, a home run and two RBI against Carroll. This week: Azle on Tuesday. Results: The Eagles defeated Richland (North Richland Hills) 12-2, and Crandall 4-2. Stats: Tate Van Poppel got the win, striking out seven. Alex Gonzales and Preston King each had a double and Cade Merka had a triple. King added a triple against Crandall and Hayden Clearman had a double. This week: Decatur on Friday. Results: The Wildcats defeated South Brunswick (Southport) 4-2 and E.A. Laney (Wilmington) 8-1. Stats: Jonathan Manis was 2-for-3 with two doubles and two RBI against South Brunswick. Blake Walston got the win, striking out 17. Manis also went 3-for-4 against Laney. This week: Topsail (Hampstead) on Tuesday, Ashley (Wilmington) on Friday. Results: The Wolverines tied Alemany (Mission Hills) 4-4 early in the week before winning 6-3 and 11-7 against their Mission League foe. Stats: JP Corrigan went 2-for-3 with a home run and four runs scored in the 11-7 victory. Pete Crow-Armstrong had a triple and two RBI in the 6-3 win and a double in the tie. This week: Chaminade (West Hills) Tuesday, Wednesday and Friday. Results: The Mustangs upped their shutout streak to four in a row by beating Cypress Lakes 1-0 and 10-0. Stats: Matt Thompson struck out 11 in a 1-0 victory. J.J. Goss threw a one-hitter with 11 strikeouts and also hit a triple in the 10-0 win. This week: Cypress Springs (Cypress) on Tuesday, Friday. Results: Defeated San Juan Hills 4-2. Stats: Luke Davis went 2-for-3 with two doubles and two RBI. This week: Mira Costa at Boras Classic. Results: The showdown against American Heritage (Plantation) was postponed, but Doral did defeat Sunset (Miami) 8-1. Stats: Gabriel Gutierrez was 3-for-4 with a home run and four RBI, and Adrian Figueroa was 3-for-4 with a home run, a double and three RBI against Sunset. This week: St. Brendan (Miami) on Tuesday, Archbishop Carroll (Miami) on Thursday. Results: The Lancers swept St. John Bosco in Trinity League play, including a pair of shutouts, winning 7-1, 5-0 and 4-0. Stats: Garrett Frechette was 2-for-3 with a triple and three RBI in the first game. Jonathan Guzman gave up three hits in five innings and struck out nine in the second game. Max Rajcic tossed a two-hitter with five strikeouts in the third game. This week: Boras Classic, starting on Tuesday. Results: Defeated Elgin 6-1 and 16-0. Stats: Ty Tilson was 2-for-4 with a double and an RBI in the first game. He went 3-for-3 with two doubles and a triple and five RBI in the second game. This week: Bastrop on Tuesday and Friday, Cedar Park on Saturday. Results: Defeated Tampa Catholic 10-0. Stats: Bennett Lee was 2-for-3 with a double and a home run and two RBI in the win. Ethan Valdez also had a home run. This week: Sarasota on Monday, St. Ignatius (Ohio) on Wednesday, Robinson on Friday. Results: Defeated Berkeley Prep 3-0 and Clearwater 12-2. Stats: Nolan Hudi threw no-hitter with 12 strikeouts and two walks in win over Berkeley Prep. Vince Smith helped with a home run. Christian Cairo went 3-for-4 with a double and a triple against Clearwater. This week: Tarpon Springs on Monday, St. Ignatius (Ohio) on Tuesday, Clearwater Central Catholic on Friday. Results: Defeated Comeaux (Lafayette) 7-2, Lafayette 7-5 and Sulphur 13-1. Stats: Bailey Juneau was 2-for-3 with an RBI against Comeaux. This week: South Beauregard (Longville) on Monday, LaGrange (Lake Charles) on Thursday. Results: Defeated White County (Cleveland) 4-0. Stats: Trey Baker was 1-for-3 with a double and an RBI against White County. This week: White County on Monday, Flowery Branch on Wednesday and Friday. Results: Defeated Los Alamitos 9-7 and Edison (Huntington Beach) 7-2. Stats: Jake Vogel had two home runs and Blake Penso had a home run. Josh Hahn had a grand slam and five total RBIs against Edison. This week: Plays in Boras Classic. Results: A big week for Parkview as they outscored opponents 40-1. Beat Norcross 9-0 and 2-0, Berkmar 18-0 and Hoover (Ala.) 11-1. Stats: Jonathan French and Stephen Hrustich both homered against Norcross while Max Pate and Hrustich each had two doubles in the second game against Norcross. French had two doubles and five RBI against Berkmar. French added a home run against Hoover. This week: Berkmar on Monday, Meadowcreek doubleheader on Wednesday, Buford on Thursday. Results: Defeated Stranahan 15-0 and Miami Senior 10-0. Doral Academy game was postponed. Stats: Gavin Casas had two doubles and Justin Quintana had a home run against Stranahan. Ryan Cabarcas and Devin Futrell combined for a no-hitter with Cabarcas going four innings with six strikeouts for the win against Miami Senior. This week: Trinity Christian Academy (Jacksonville), Providence School (Jacksonville), George Jenkins at Spring Break Tournament in Jacksonville. Results: Defeated Montverde Academy 11-1, Key West 7-0, Grandview (Colo.) 5-0 and Christian Academy (Memphis, Tenn.) 5-4. Stats: Brennen Kell went 2-for-3 with a double against Montverde Academy. He also went 2-for-4 with a double against Key West. Camden Traficante went 3-for-4 with a double against Grandview. This week: Seminole on Tuesday, Friday. Results: The Bears went 3-1 at the Albuquerque Metro Tournament. They beat Albuquerque 4-1, Sandia 2-1, Eldorado 19-13 and lost to St. Pius X 1-0. Stats: Dawson Burton had a triple and Josh Apodaca had a double against Albuquerque. Ben Schoneman threw a one-hitter with 15 strikeouts. Schoneman also had a home run against Eldorado. This week: Rio Rancho Tournament. Results: Defeated New Iberia 4-0, LaGrange 13-3 and 11-0 and lost to Lafayette 5-3. Stats: Cameron Meeks threw a three-hitter with seven strikeouts against New Iberia. Silas Ardoin was 3-for-4 with a double, triple and two RBI in the first game against LaGrange. Michael Harlow had a double and a triple in the second game against LaGrange. This week: Comeaux (Lafayette) on Thursday. Results: Defeated Petal 10-0 and 6-5. The Rebels dropped two games to Hattiesburg 6-0 and 6-2 over the weekend. Stats: Trevor McDonald threw a one-hit shutout with nine strikeouts and also had a home run in the 10-0 win over Petal. Logan Tanner struck out 11 in the second game. This week: Oak Grove (Hattiesburg) on Tuesday, Friday; Biloxi, Vancleave on Saturday. Results: Defeated Westminster Christian 10-3 and Troy Buchanan 10-7 to win the Troy Classic. Stats: Kylon Cunningham went 3-for-3 with a double, a home run and two RBI against Westminster while Elias Stevens was 3-for-4 with a home run and four RBI. This week: Waterloo (Ill.) doubleheader on Tuesday, O'Fallon (Ill.) on Thursday. Results: Defeated Simeon 10-4, Maine South 5-0, Jones 5-0, Brooks 7-3. Stats: Edwin Alvarez hit a home run against Simeon and Vytas Valincius had two doubles. Max Engstrom had 11 strikeouts against Jones. Matt McCormick went 3-for-3 with two doubles and two RBI against Brooks. This week: Lincoln Way Central on Tuesday, Holy Trinity on March 26. Results: In Florida, Owasso lost to Osceola 9-3, but beat Santa Fe Catholic 6-4, Bartow 7-6 and Lake Wales 11-1. Stats: Brody Green had a home run against Santa Fe Catholic. Cam Thompson had a home run against Bartow. Colton Mullinax had a triple and three RBI against Lake Wales. This week: Lakeland (Fla.) on Monday.